This video may be the most awkward thing you see all day. Batman strolls into a happening joint, meets a pretty gal, then gets roofied in his glass of orange juice. But before he succumbs to the drugs effects he cuts loose with said pretty gal. It's strange to say the least, and not surprising that drugs were involved. 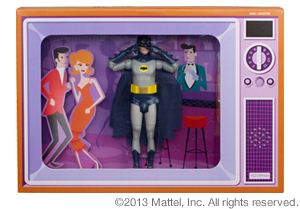 Now you can relive this classic moment from tv for ever and ever in the comfort of your own home with the Batusi Batman from Mattel. 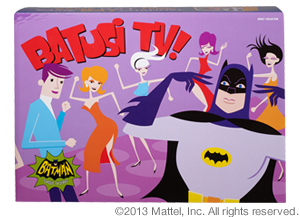 The box is really the best part, as it features retro art from Shag, plays music, and has controls so you can make Batman dance. This will first be available at this year's San Diego Comic Con and then online August 5th at www.mattycollector.com.